OXFORD, Miss. 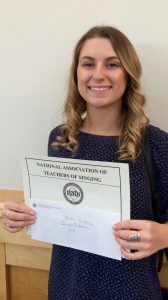 – Several University of Mississippi students fared well in the recent 2017 National Association of Teachers of Singing Southern Regional Competition in Hattiesburg, which draws voice teachers and students from universities, high schools and private studios in Arkansas, Louisiana and Mississippi. Senior music major Lacey Hindman was a finalist and placed third in her category, Senior Women. Of more than 50 competitors in Hindman’s category, only 19 advanced to the semifinals and only five qualified for the finals. “I cannot express the amount of support I have from the amazing music faculty,” Hindman said, crediting associate professors Nancy Maria Balach and Amanda Johnston with preparing her for the performance. Balach noted how hard-working and dedicated Hindman is to her craft, saying that Hindman is the “whole package” when it comes to musical talent. Six other music majors were semifinalists in their respective categories. They are: master’s students Melanie Culhane, from Cordova, Tennessee, and Caitlin Richardson, from Mahomet, Illinois, in the Younger Advanced Women category; Madilyn Morris, a freshman majoring in music from Pheba, Freshman Women category; Lawson Marchetti, a freshman music major from Jackson, Freshman Men category; Carley Wilemon, a sophomore music major from Aberdeen; Sophomore Women category; and Jocelyn Sanabria, a senior music major from Atoka, Tennessee, Senior Women and Upper College Music Theatre Women categories. Besides several student competitors, Ole Miss had three faculty members from the Department of Music serve as judges: Balach, Brad Robinson and Jos Milton, all associate professors. 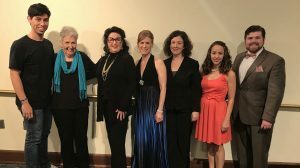 Cynthia Linton, an emerita faculty member, also helped judge the competition, and Johnston served as a collaborative pianist for the competition. The competition provides many opportunities for the student performers, Balach said. They get to see how they stack up against other singers at their level, receive feedback from other teachers and get an opportunity to network. “I am extremely proud of all of our students. They represented themselves and our university with great artistry, confidence and poise,” Balach said. Several UM faculty members, students and alumni also were invited to perform the Tony Award-winning play “Master Class” at this year’s NATS competition. This production was a collaborative effort with Sandra Moon and Patt O’Neill, faculty members from Louisiana State University; Susan Ruggiero, a faculty member at the University of Southern Mississippi; and Kyle Davis, a UM alumnus who is on the faculty at the University of Alabama. The show featured Balach and Johnston, along with student performers Culhane, Hindman and Sanabria. The play was selected as a showcase event for this year’s competition after its October 2016 production with LSU and Theater Baton Rouge. It was produced by Ole Miss’ Living Music Resource, an effort to produce an online library of interviews and music, led by Balach and partially funded by a Southeastern Conference Travel Grant.